December 26, 2019 12:13 am est: 3 South Solar Eclipse @4Cap06 conjunct Jupiter @5Cap20 3rd and 4th houses in Washington DC. ASC 4Lib32 conjunct the natal Neptune of Donald Trump and America's natal Saturn-Neptune midpoint; Hour of Mars (@24Sco30 in 2nd house of the National Treasury and conjunct Trump's natal IC of Endings); Mars is leader of a BOWL shape denoting a selfish trailblazer alone against the world (M.E. Jones). 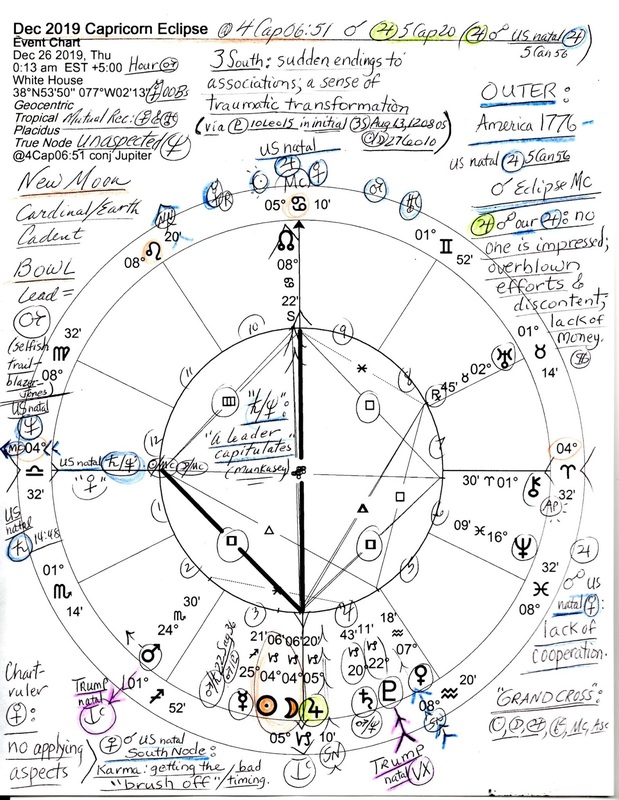 Most midpoint pictures and pairs referenced in this post are from Ebertin, Tyl, and Michael Munkasey which you see penned into the center of the chart: "Saturn-Neptune: a leader capitulates." 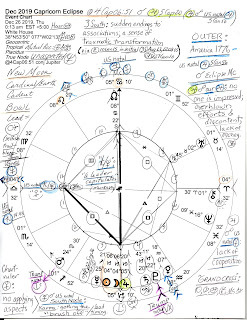 This is one of the possibilities of this planetary combination which, in America's 1776 chart (5:09/10 pm LMT) conjoins our natal Midheaven (1Libra). Saturn-Neptune also rises in the natal horoscope of Donald Trump (June 14, 1946 10:54 am est Queens, NY) showing his early environment as oppressive and difficult. Whether Trump will capitulate before or by December 2019 is anyone's guess (being the unpredictable Uranian that he is) but I type today on January 16, 2019 with the Bob Barr confirmation hearings ongoing and the ultimate fate of the Mueller report in doubt if/when William Barr becomes Trump's Attorney General. Mr. Barr, if confirmed, may redact or withhold all or part of the findings in spite of the public's need to know. Now the Saturn-Neptune pair in society may also represents such things as: secret or invisible government, socialism, communism, Marxism, and so on. Weakness, illness, suffering caused by others, oppressive family circumstances, sense of "being out of the group" (Tyl), plus, a feeling of confinement or inhibition may also apply. 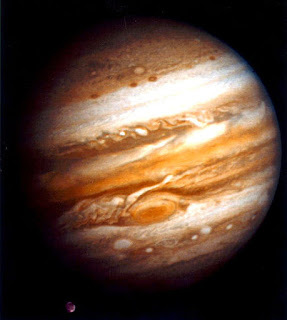 Now let's note that fact that although protective Jupiter @5Cap20 conjoins the 3 South Solar Eclipse (themes listed, below), however, Jupiter simultaneously opposes America's natal Jupiter (5Can56) which suggests a period when no one is impressed, efforts are overblown, there is discontent, and a lack of funding and resources. 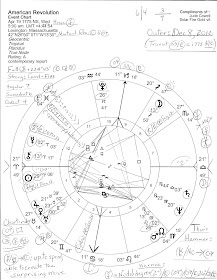 The Jupiterian North Node of future direction @8Can22 points toward the natal Mercury of Donald Trump which, as you know, is afflicted by a square from his natal Neptune @5Libra--which rises in this chart. Some potentials for Saturn-Neptune with more Neptune involve 'presenting newly visualized views of reality or the future; dissolving rigid or outmoded structures; breaking through rigid patterns; inspiration derived from drugs'; and/or, 'illusive heightened awareness using escape' (Munkasey). Now you may agree that at least some of these potentials describe what Trump has done or attempted to do from the Oval Office and he has done them with the oppressive quality of Saturn-Neptune attached. As I type, the Trump Shutdown continues to afflict our nation. In the Solar Eclipse horoscope, chart-ruler Venus @7AQ18 is posited in 4th house and conjoins US natal South Node (karma; getting the 'brush off'; bad timing--Ebertin) so we have that not going for us. The lack of aspects by Venus emphasizes the sign and house position of the money planet of relationships, diplomacy, and values (currency devaluation?) so I imagine that American diplomats (if we have any by then) will not be 'acing it' as they already aren't under Putin puppet Trump (boy, did Hillary call it in the 2016 Campaign debate!) But whether or not Trump is history before, by, or just after the end of 2019, America has some serious rebuilding to do from the damage he, the GOP, meddling billionaire donors, Murdoch, Putin, and perhaps others have caused. Then there's the unaspected Neptune in 6th house (Civil, Military, Police Services) still floating through its own shady sign of Pisces but here with a materialistic view of the world for Neptune's usual lofty inspiration is not shared with the others planets--and Neptune's deep sense of isolation increases as its dreams are kept to itself. Now I shall briefly mention the midpoints affecting Trump's natal Moon-SN conjunction (or his Sun-NN opposite along with natal Uranus in Gemini) but suffice to say that difficulties ensue caused by Mars-Saturn and Mars-Pluto in the 22--24 degree range of Sagittarius. Plus, restrictive Saturn is at a critical degree (20Cap) and transformative Pluto @22Cap11 conjoins the natal Vertex of Donald Trump as the two heavy weights ready for their Great Conjunction on January 12, 2020 @22Cap46--spot-on Big T's natal Vertex of fated encounters. So yes! For the sake of America and the common good, yours truly is cheering for Donald Trump--to clear outta Dodge before the sheriff arrives if he knows what's good for 'im. And take his sidekick Pence with 'im. 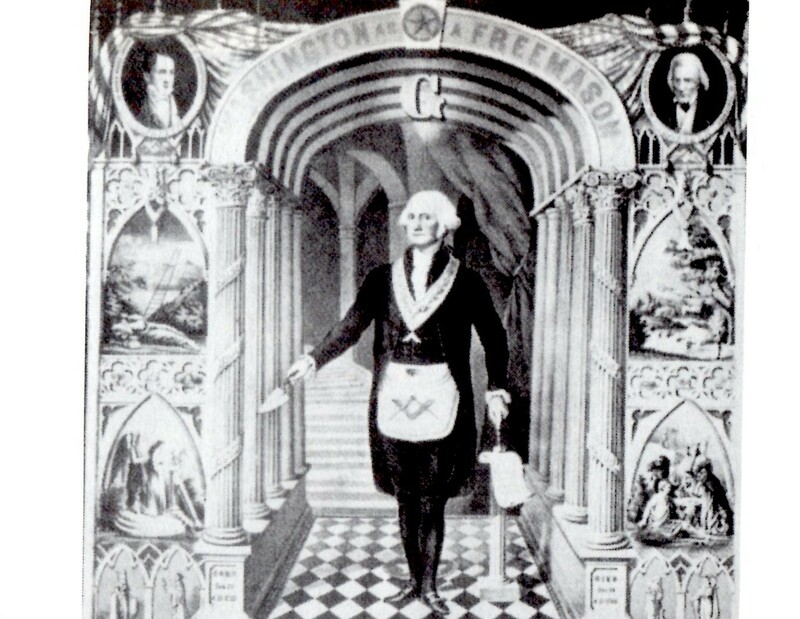 A Very Much Related Previous Post: Will Regulus Assure the Destiny of Donald Trump? with the royal star's caution, "success if revenge is avoided." Too late for that!